Whether The View will be watchable once loud-mouthed phony Rosie O'Donnell joins is a major question that needs answering. 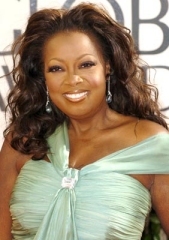 But a big step in that direction appears to have been taken as it's being reported that Star Jones is getting booted from the show. Like, very soon. Maybe even next week. I'd shed a tear for Jones- if she had other work lined up. She doesn't. Apparently, on-air job openings for an abrasive, loud-mouthed, condescending moron are somewhat limited. Who would've thunk it?.